Hawick go to ground against Aberdeen Grammar at Melrose last Saturday (picture by Alwyn Johnston). After the enormous success of the Melrose Sevens last weekend, it’s Hawick’s turn next to take centre stage. The Robbie Dyes are preparing to host the BSW Timber Group Hawick 7s ‘Festival of Rugby’ and the latest round of the Kings of the 7s competition. The Kings series rolls into Mansfield Park on Saturday for its fourth round – the first tournament of a what is shaping into a rugby packed double-header weekend, with the Berwick 7s following on Sunday. Now in its 124th year and one of the oldest sevens competitions in the Kings series, Hawick 7s has rebranded itself the ‘Festival of Rugby’. “We are massively looking forward to this weekend’s event. 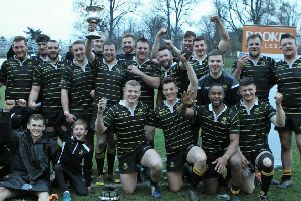 A lot of work has gone into making this a great showcase for Borders rugby,” said Hawick president and sevens convenor, John Thorburn. Hawick will welcome the usual Kings sides, with the addition of the Hawick Force and Hawick Linden, in a knock-out style competition. Along with the senior tournament there will be a semi-junior competition and, for the first time in its history, a women’s competition will run alongside the senior ties. The ladies’ event, sponsored by Chrysties Furnishing Centre, will feature Biggar, Liberton, Melrose, Kelso and a pair of sides from Edinburgh University. A coaching clinic will also be on site, with specialist coaches providing sevens rugby training. Melrose v Kelso, Heriots v Berwick, Edinburgh Accies v Hawick, Watsonians v Peebles, Jed-Forest v Hawick Force, Hawick Linden v Gala. Selkirk and Boroughmuir have byes.